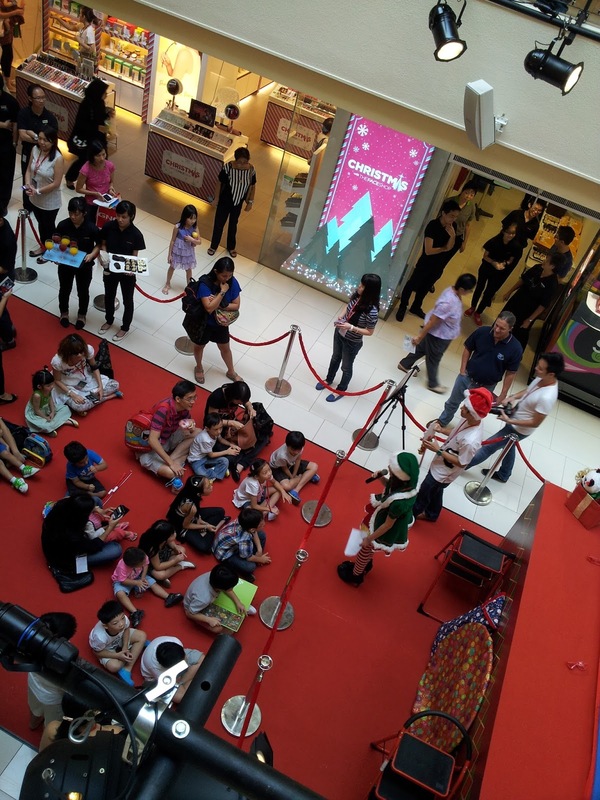 Happened to be in Parkway today where they have a private event for launching the christmas events - Jumpin' Jammin' Elves. Alyssa and myself manage to catch the event and is really good check out the video! 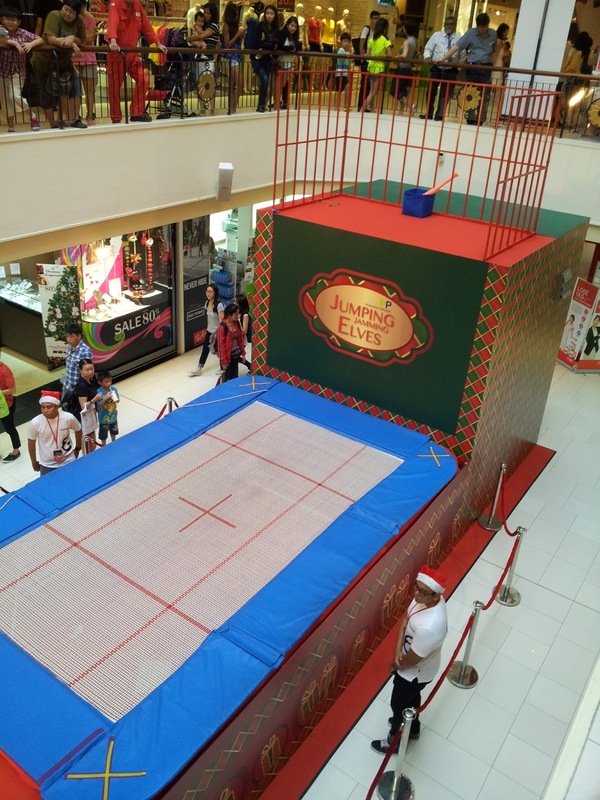 The event will be till 8 Dec 2013 (excluding 2 Dec) time will be 3pm, 5pm & 7pm! Simply spend $50 and redeem a pass to jam with the elves, American Express card members need only $40! Something different this time really awesome! 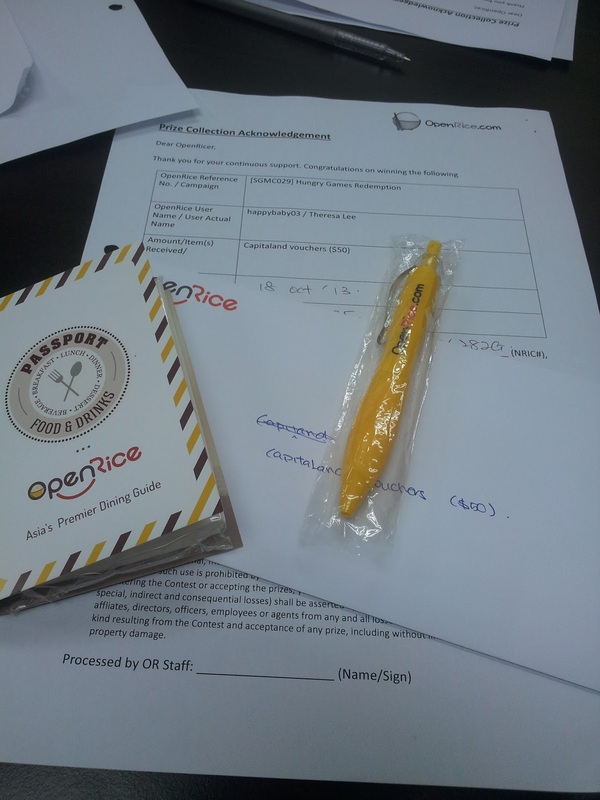 Went Openrice to collect my vouchers with PL, AL & Wendy .... another good reason for me to write hard in order to go for more shopping! 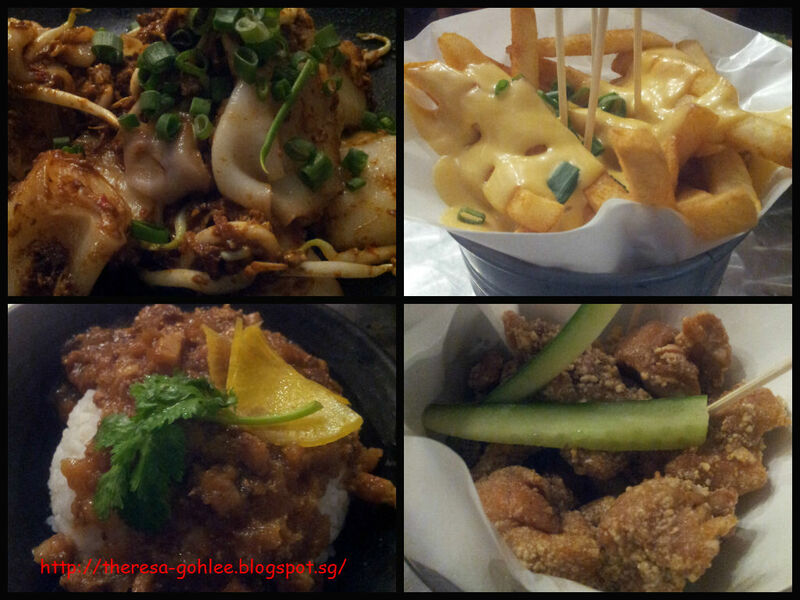 We shared a 3 for $18 side dishes - Truffle Fries, Harrisa Prawn, Sweet Potato nibbles, Beef, Chicken and Pork Sausage. We also have Squid Ink Pizza and Chicken Satay Pizza I prefer the Chicken Satay Pizza love the sauce and overall food is quite good. 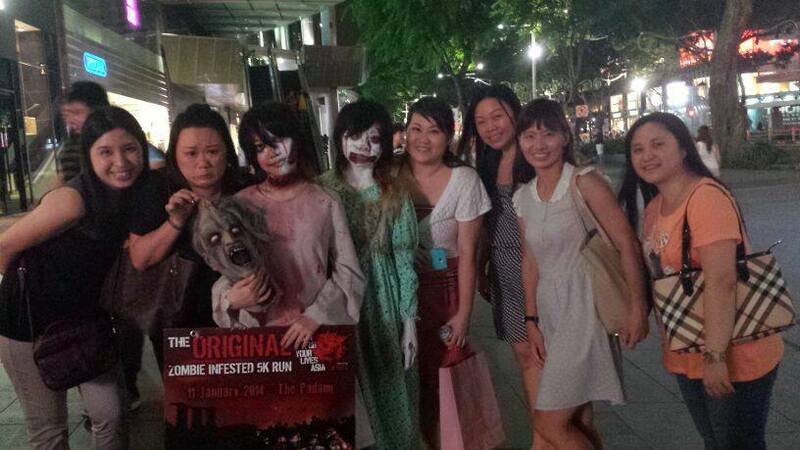 After dinner we went for a walk and met the Museum of Horror - The Twins. The beautiful make up really impressed me! 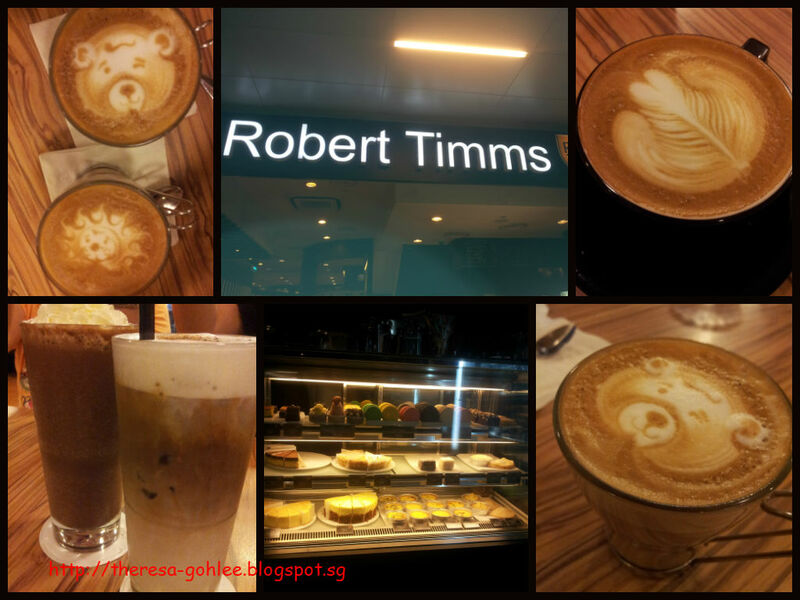 After walking around we decided to rest at Robert Timms ...... coffee, chit chat really very relax and happy to get to know more friends through Pauline! 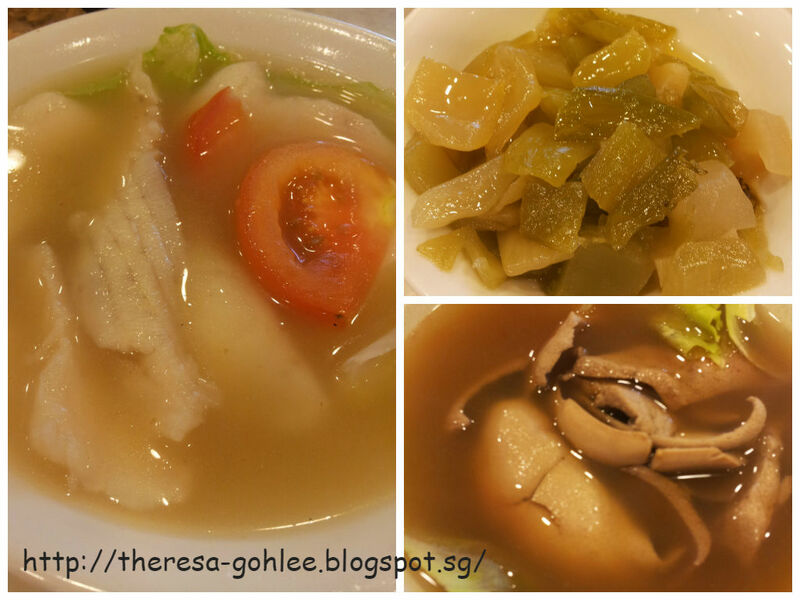 Goh love 卤肉饭 so I suggest going to 八度空间 located at Katong to have our dinner. Quite a number of diners there when we step in. 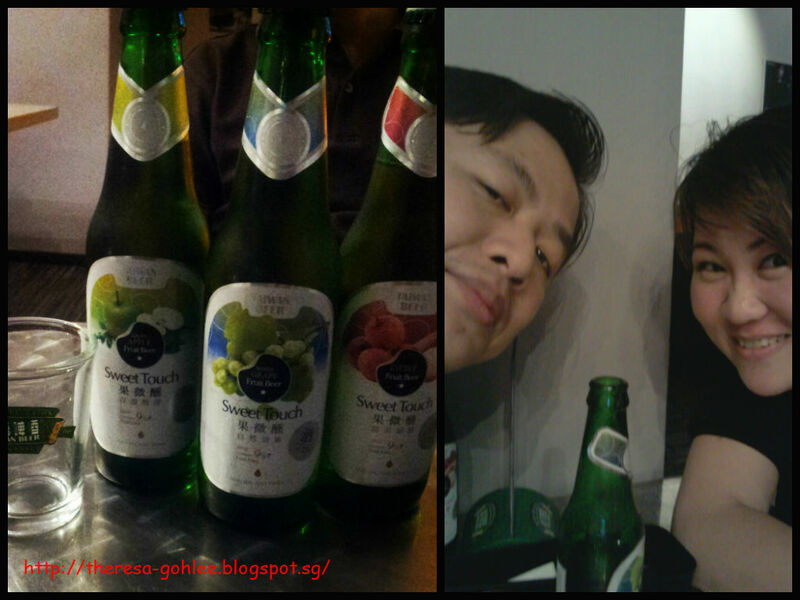 Since there is promotion on the Taiwan beer we ordered and drink it and decided to keep 2 bottles cos Goh is driving and he didnt want to risk though the percentage is low I an say he is very responsible! 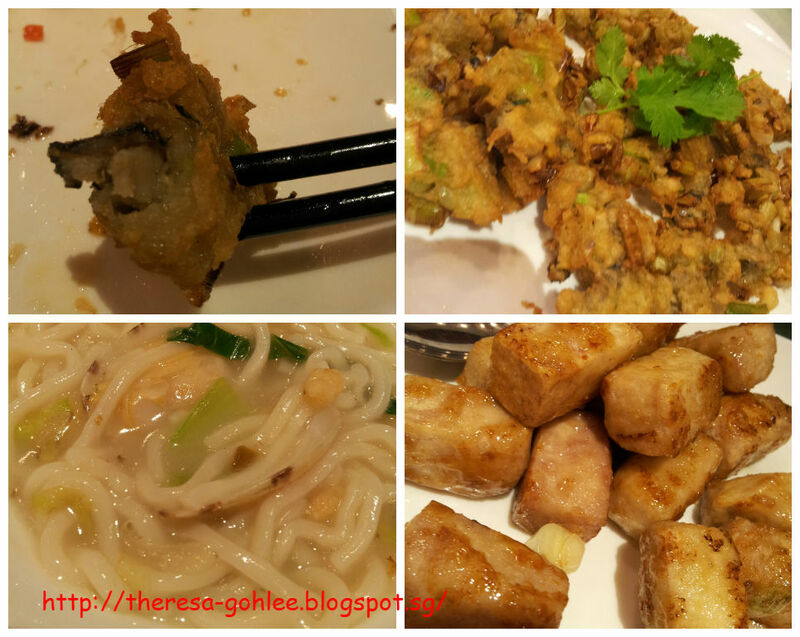 I ordered their XO sauce fried Chee Cheong Fan the taste surprise me not too oily and yummy. As for his 卤肉饭not to his expectation and is small in size. Lucky we still have salted chicken and cheese fries to go along with the food. 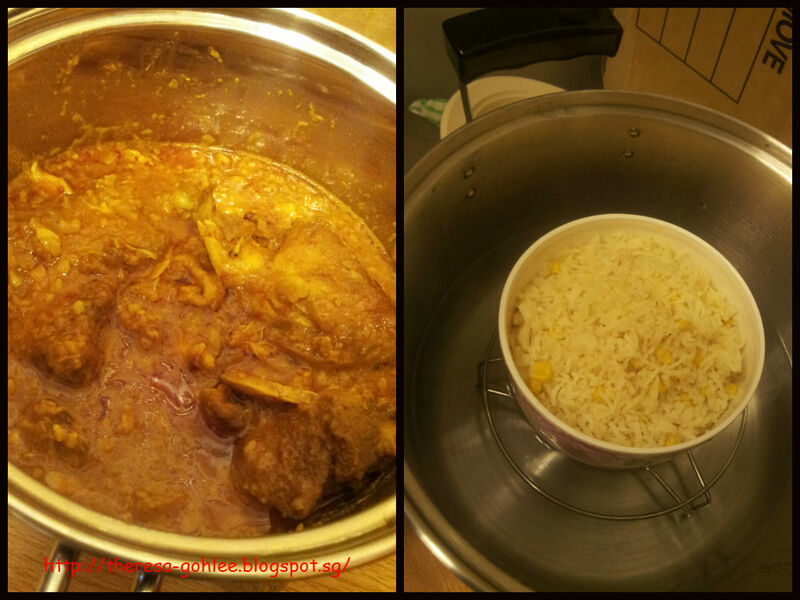 Bahrin came with some food from his Granny to us, love he chicken curry with the butter rice from them. Corn is added into the butter rice and it goes well with the curry chicken .... chicken is soft and we also go with some bread. YUMMY! Today is Hari Raya Haji so this little gal went back home to stay one night with us and we are going to bring her back to in law's place. So before heading back to in law's place we went over to Katong Shopping Centre to buy some dessert and so coincidentally I bump into my bestie - Valerie! She is going to visit a friend and I brought her to the dessert shop so she can get some dessert for a friend too we chatted for awhile before parting. 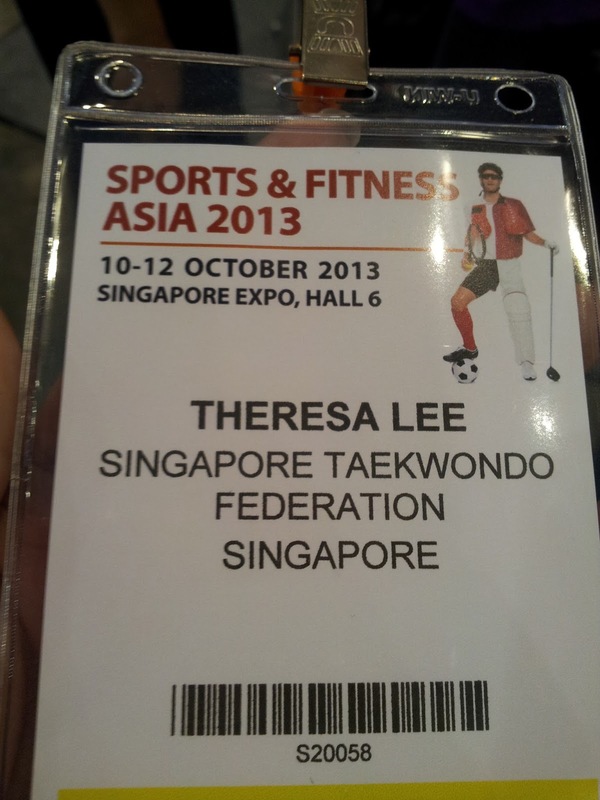 Nice bumping into her cos is been a while since we last met everyone so busy with work and personal life! MIL make steamboat today so I also bought some food to go along with it. 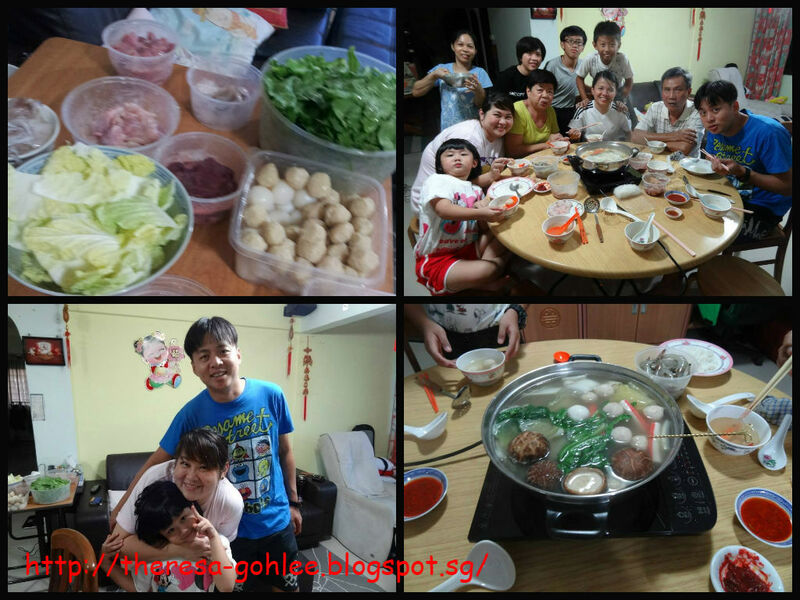 Good to have steamboat some time ..... and I actually love to eat steamboat just that my Man dun really like it. 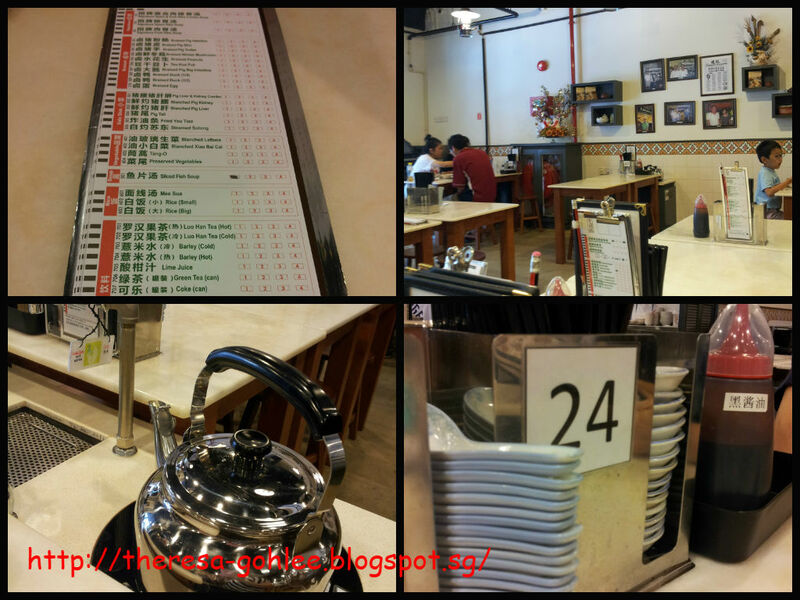 Decided to go Ng Ah Sio Bak Kut Teh for lunch as is my treat for my colleagues cos I strike a little on 4D. 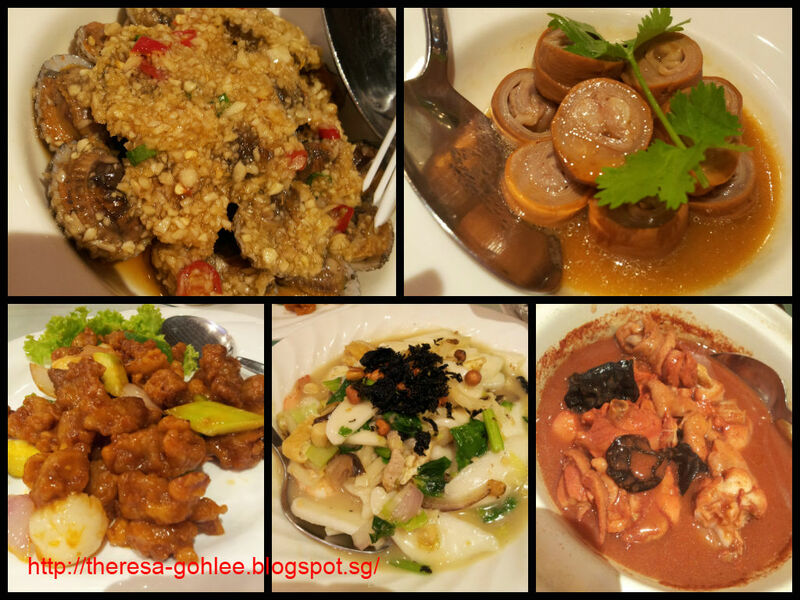 My colleagues had their BKT and go with some small dishes like Preserved Vegetables, Pig Liver, Braised Peanuts, Eggs, Tau Kwa and Tau Pok. And as for me I ordered a Sliced Fish Soup to go with my rice. Love the fish which is really fresh as my colleagues commented that the BKT is nice just that is quite expensive for small bowl. Deco of this place really retro looking .... and is good to have few friends having small gathering here to enjoy the food over a meal! 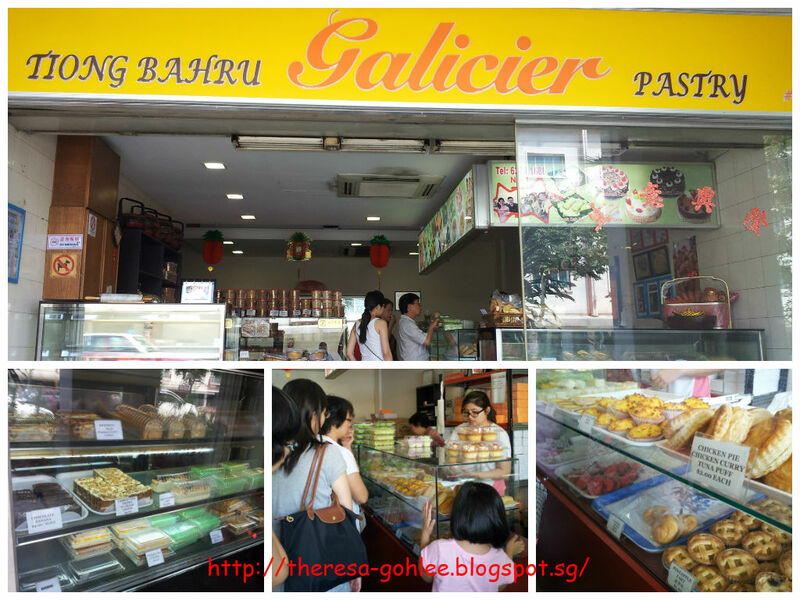 After the brunch we still go around Tion Bahru area to explore the place, Weeli quite familiar with this place also mention about Galicier a pastry shop which sells also nonya kueh! 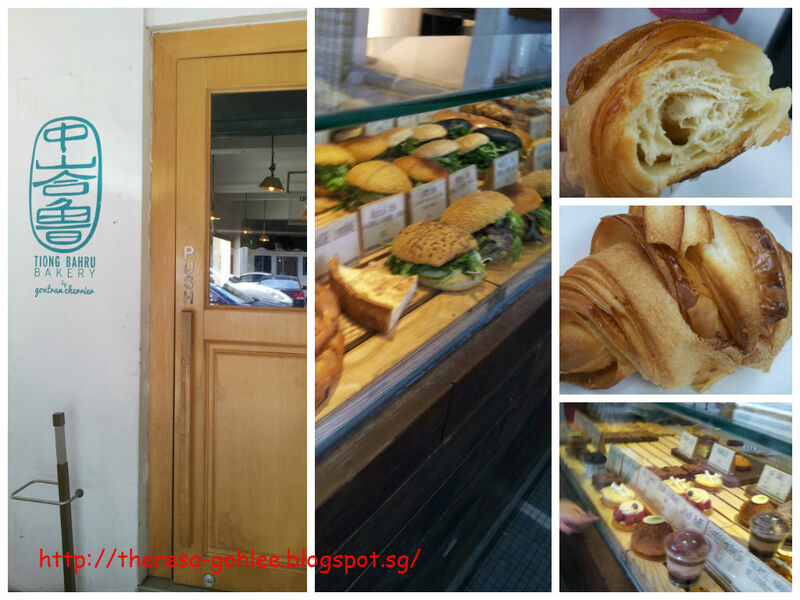 But before we reached Galicier I stopped by Tiong Bahru Bakery to look see look see and I came out with 4 croissant I am a sucker for that! But personally I feel the croissant is not really my liking .... hope I can find better one next time! Walked over to Galicier and gosh the queue was long and my eyes were on all the cakes, kueh an pies hahaha..... they look so delicious that I want to buy everything and taste everything! Goh don;t really into kueh so I have to really control myself from over buying. I bought Ondeh Ondeh, Lempar Ayam, Kueh Dadar and of cos the old school kind of butterfly cake. Ondeh Ondeh having the oozing out effect and is really chewy! Lempar Ayam is something which I find unique cos usually is Udang can be found easily. 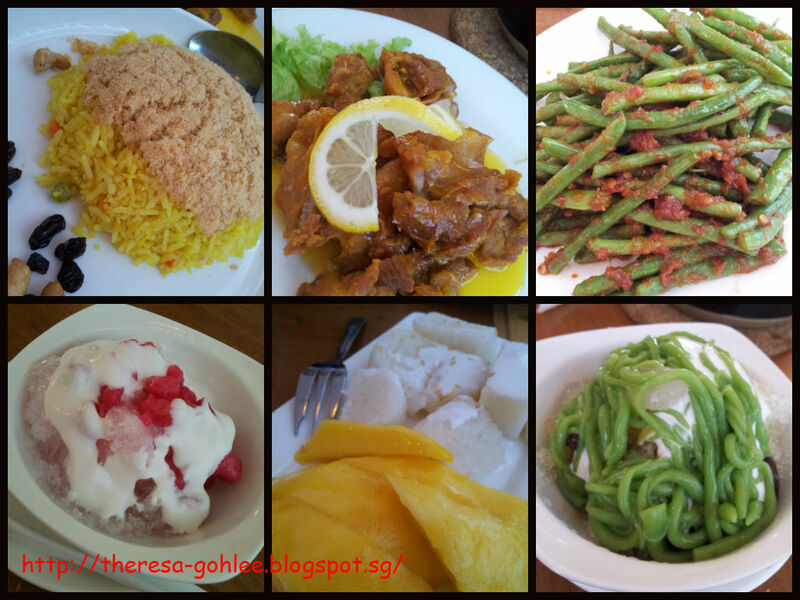 The shredded chicken is yummy and goes quite well with the glutinous rice. 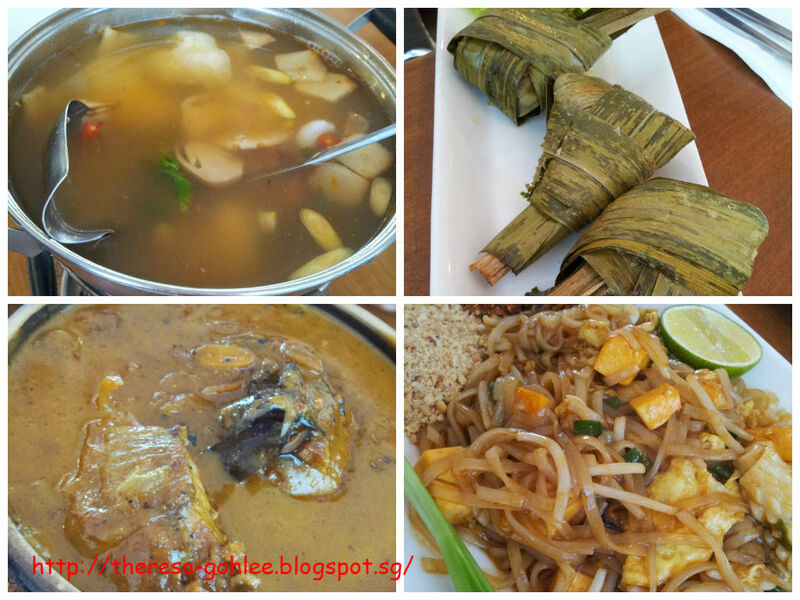 Overall I love the kueh here ... will come back for more and try different thing next time! In the evening, we headed to Parkway Putien for dinner cos we celebrating my Father-in-law and Alfred's birthday which falls on 5th & 11th October respectively. Though is a belated one I am sure the 2 birthday boy & man will be happy! 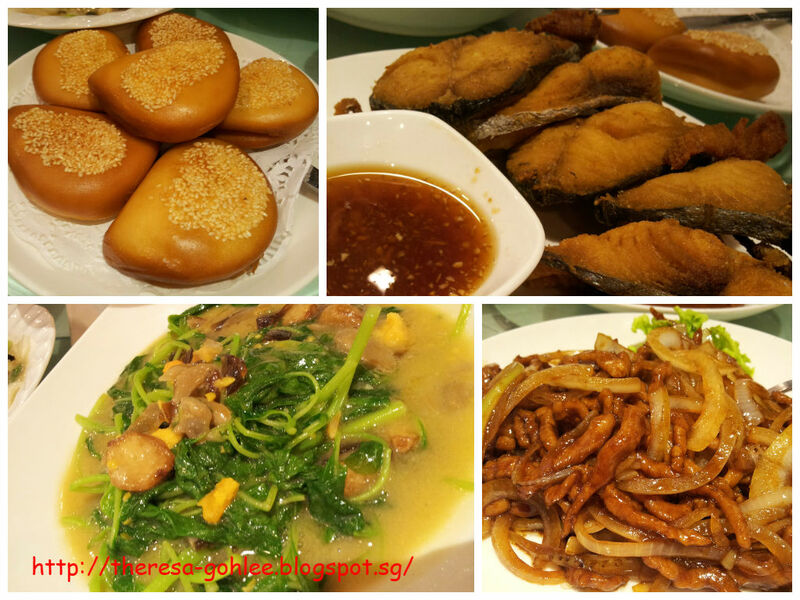 We ordered Drunken Cockles, 3 Eggs with Spinach, Deep Fried Tenggiri Fish, Oyster Omelette, Shredded Meat with Bun, Sweet & Sour Pork with Lychee, Claypot Chicken in Fermented Red Rice Wine and my favorite Stir-fried Yam. 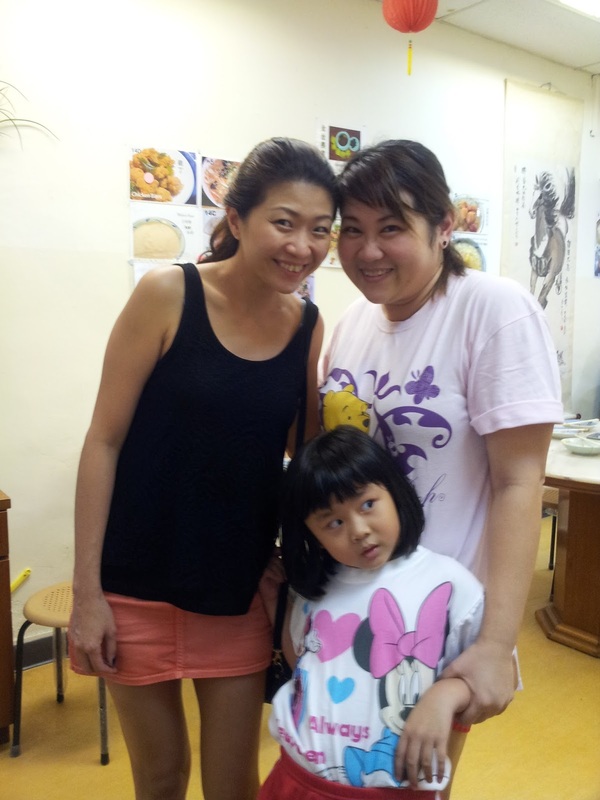 We also ordered their lor mee amd rice cake to go along with the dishes. 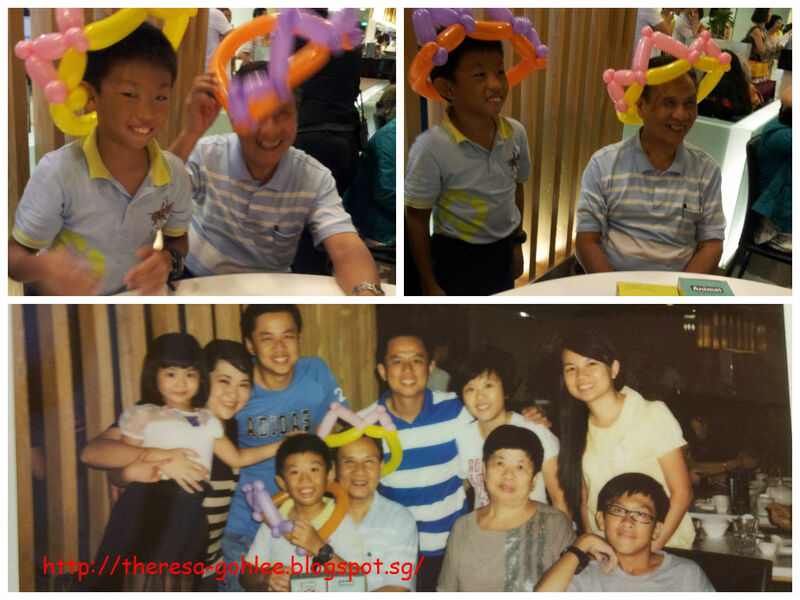 Birthday boy & man so happily having all their favourite food on the table and after the meal we have a cake cutting at the restaurant and they actually prepared some balloon sculpture and also 2 birthday gift for them. They also have polaroid camera with them and took photos for us! 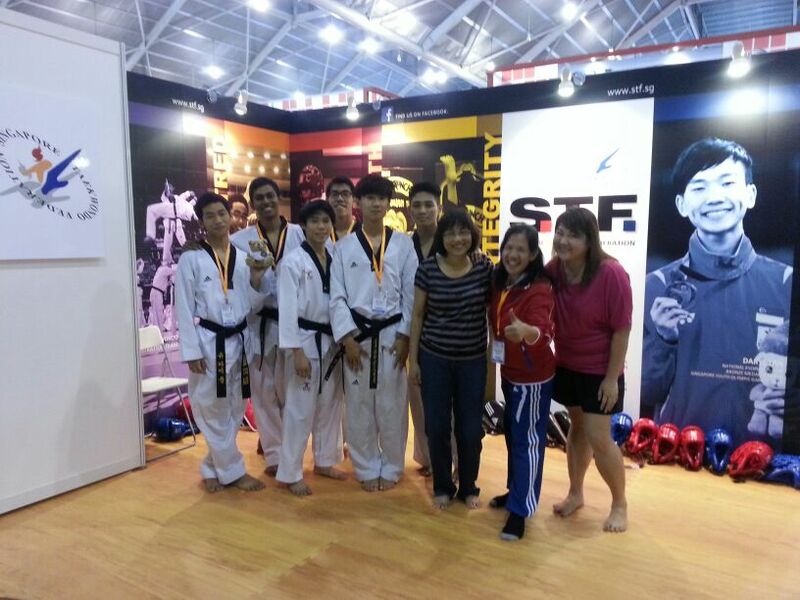 Thumbs up for the service! 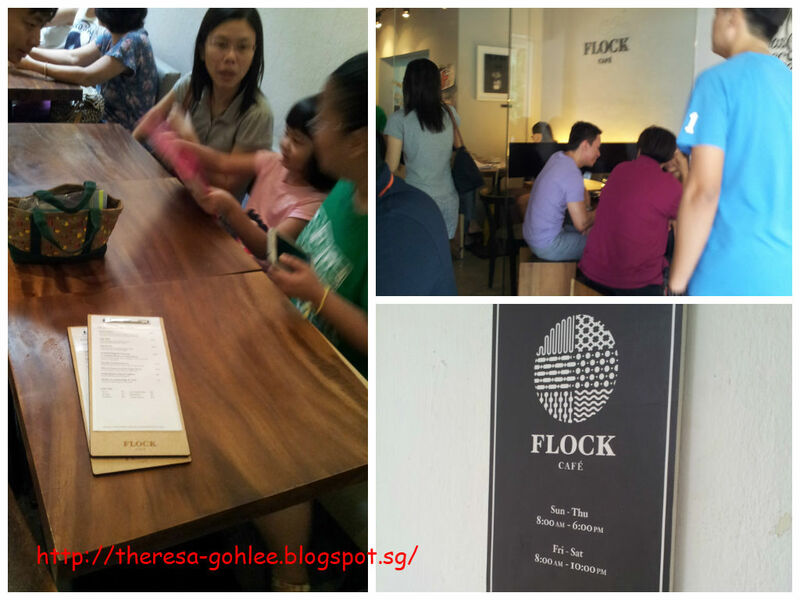 Weeli asked for a brunch on a Sunday so we went over to Tiong Bahru Flock Cafe as she mentioned that she seen this and have not try it yet. Lucky we did make a reservation cos we are rather big group with 5 adults and 1 child, the place is located at Moh Guan Terrace. They have alfresco sitting which is near to the road and gosh is all occupied! 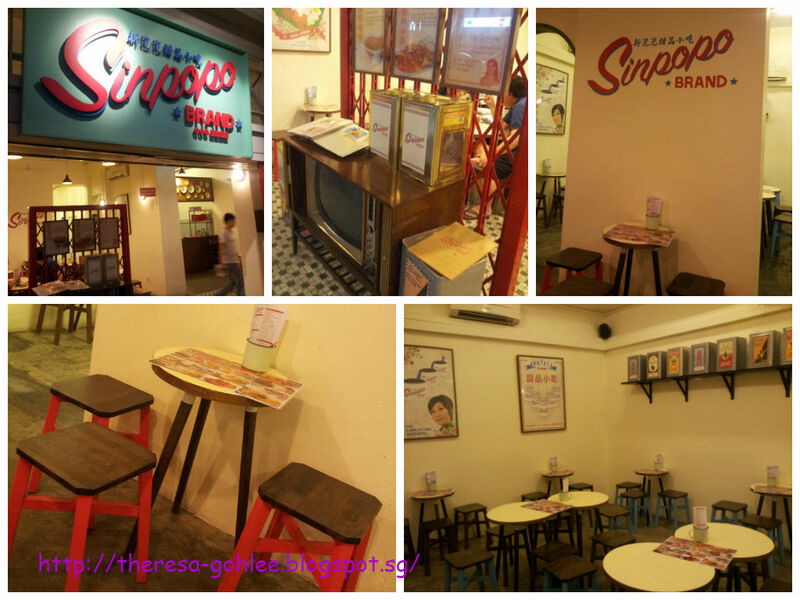 Is a rather small cafe with limited seating area.... lucky we did make a reservation before heading there cos the alfresco seating is also full. 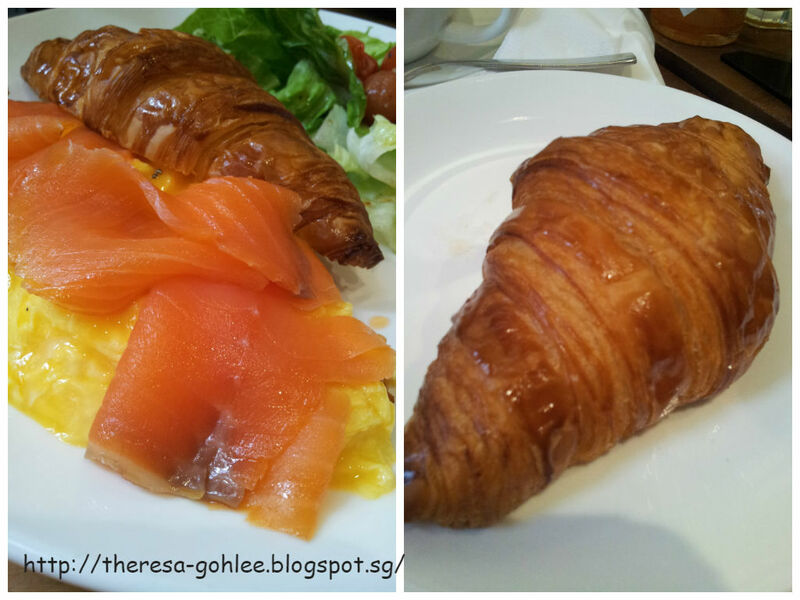 We ordered 2 Scrambled Eggs & Salmon with Croissant ($14.90 each), I love the crisp of the croissant and I like the combi of having smoke salmon awesome! 1 Egg Benny ($14.90) the runny eggs were nicely done up and no complained from friend and it was whip out in mins!!! 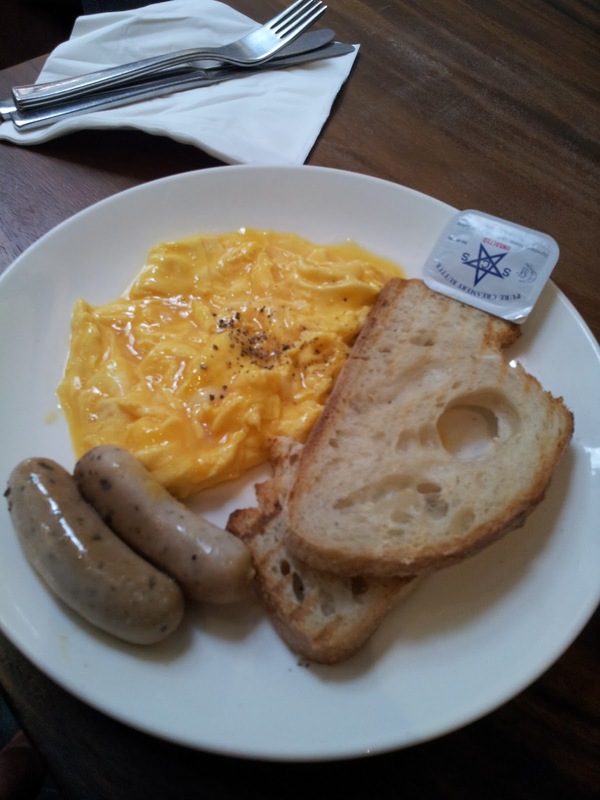 Scrambled Eggs & Toast ($7.50) add on Sausage ($3.50) quite normal no wow factor. 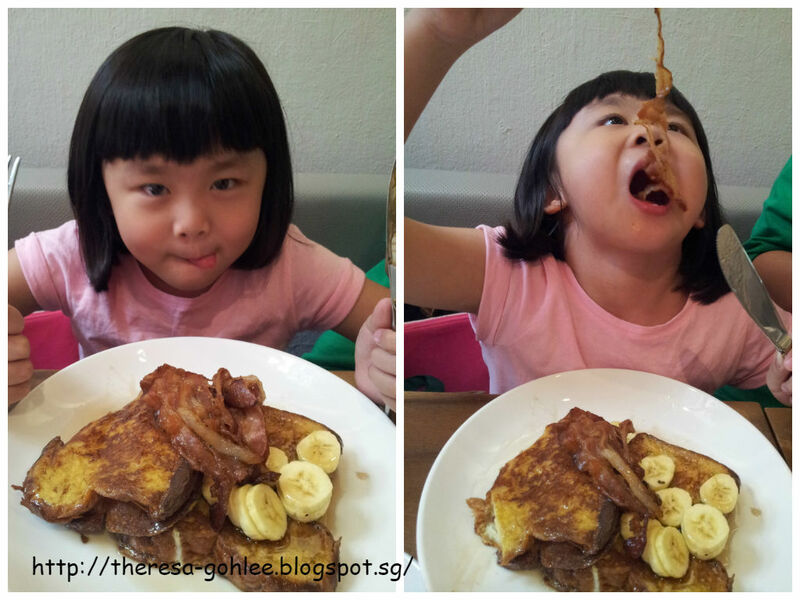 My little one go for Banana French Toast & Bacon ($13.90) the way she eat tells all is really yummy and also finished the whole plate of it! 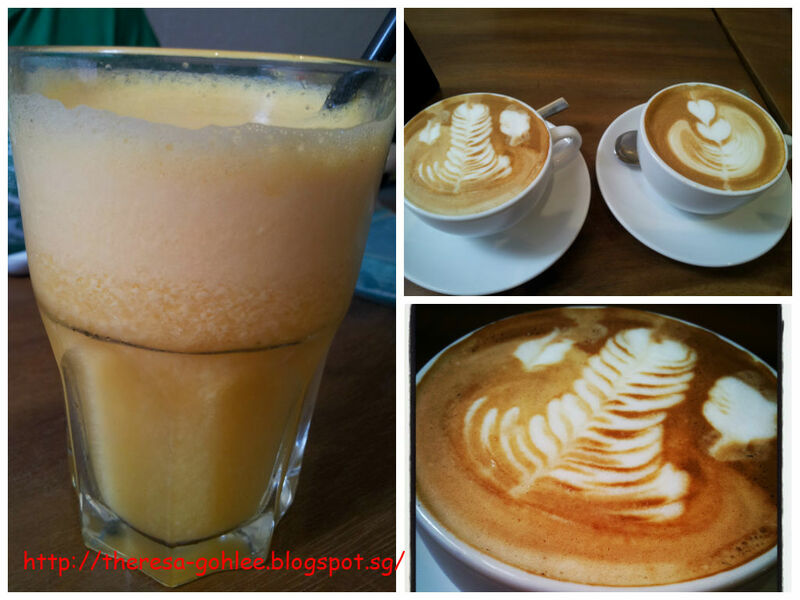 All these must go with nice beverages..... 2 Cappuccino ($5.50 each), 1 Latte ($5.50), 1 Mocha ($6) and Freshly Squeezed Orange Juice ($6). Quite like the coffee here smooth and really perks me up! 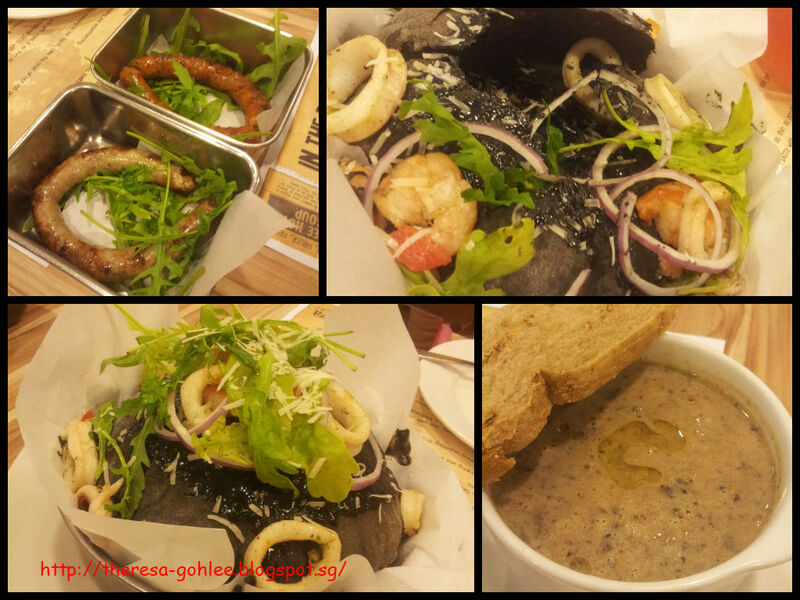 If I have the time to come by again I would like to try their pasta which served only during weekday! Nice place! Decided to go over Chinatown for breakfast so we went to Chinatown Complex Market and I like the Porridge there so I join in the queue for Chang Ji Gourmet stall. 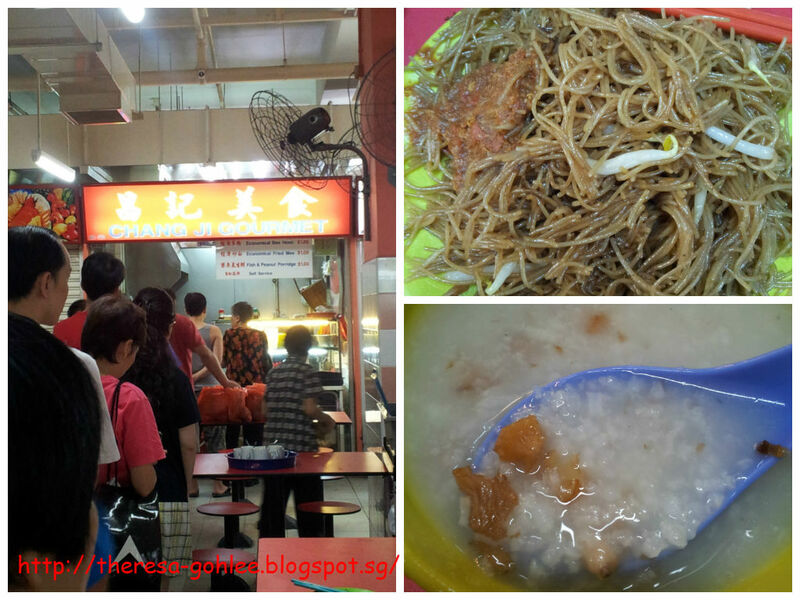 They are only selling 3 items - Fried Mee, Fried Bee Hoon and Porridge. These are really comfort food the porridge contain bits of dried fish and peanuts is a bit watery but I really love it cos very nostalgic feel. Bee Hoon and mee very normal too ..... and all items is only at $1 each. 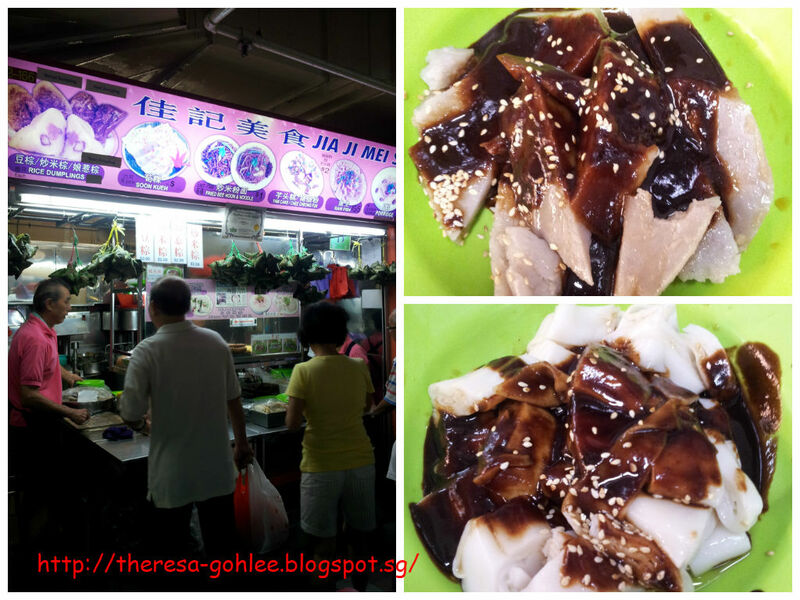 Goh wanted to have chee cheong fun so I went over to another stall to help him buy and of cos at the same time glutton me order another plate of yam cake to try. Yam cake really soft and chewy even my Goh whom don't really like kueh tasted and gave a thumbs up! As for the CCF is smooth and soft and with the sauce and sesame .... really yummy! 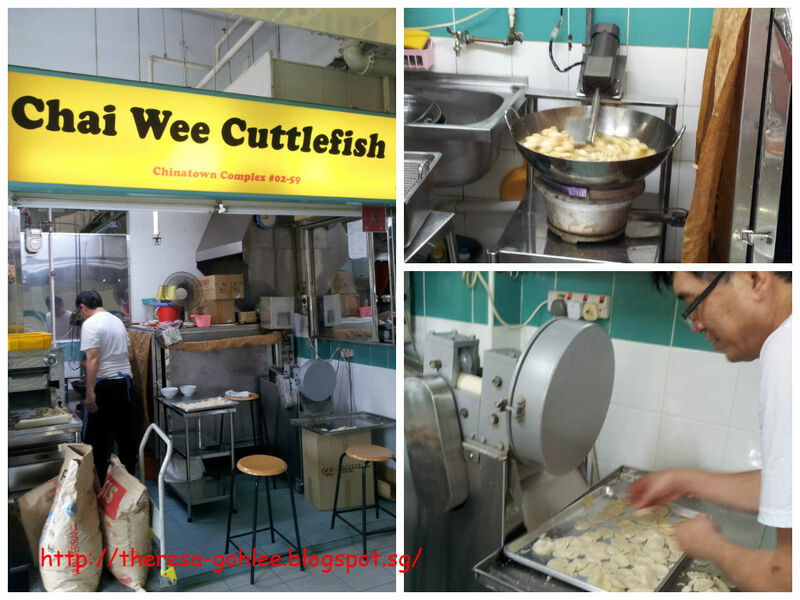 Actually my purpose of having breakfast is also looking for Chai Wee Cuttlefish. When I started working in Taekwondo office I get to know this man cos he will always call our office whenever is near CNY to take down orders from us and he will send to us! 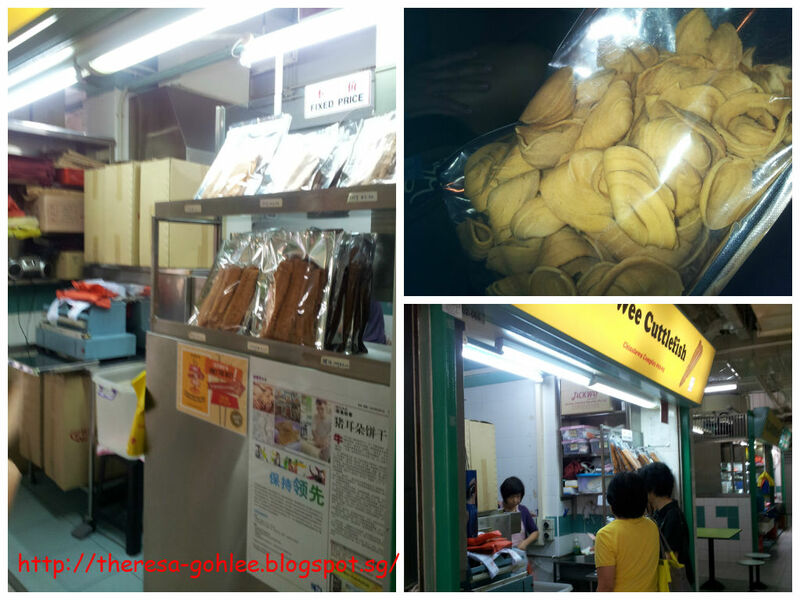 He stopped taking our orders in 2011 and we get to know that he actually having a stall in Chinatown. 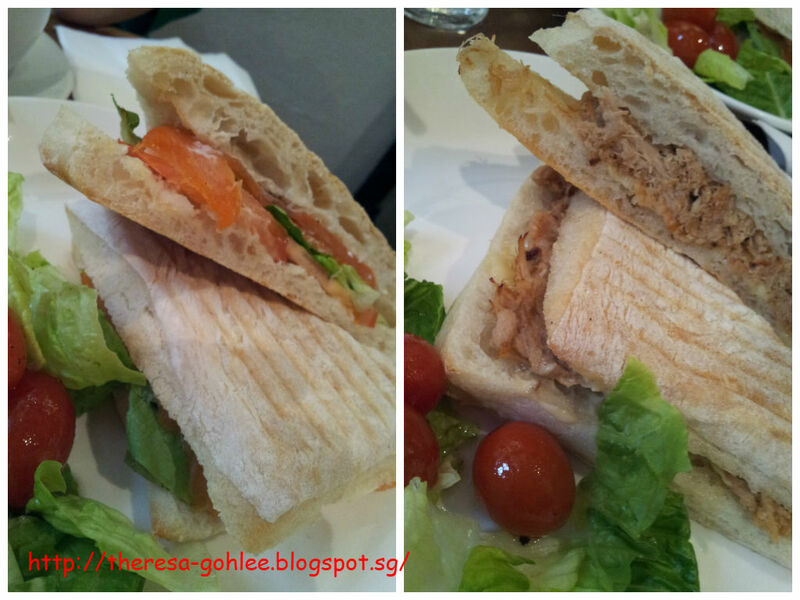 Jo and myself quite missed this cuttlefish cos the freshness and crisp really so addictive till I cannot stop eating it! Beside this he also made yummy Pig ear biscuit and when I visited him he is making and frying it! He still remember me but forget my name haha .... but glad that he still remember and talk to me while he is busying preparing the next batch of the pig ear. 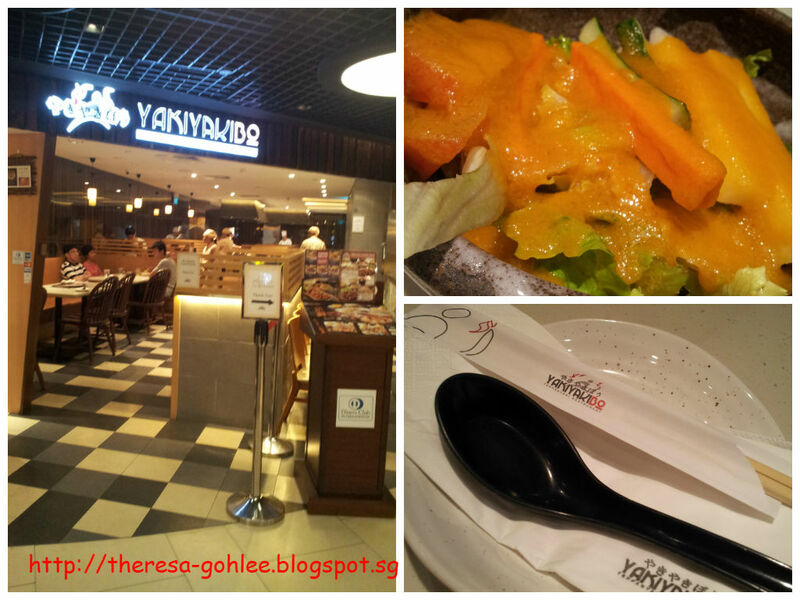 A fruitful trip there cos I brought back the food I missed in one go! After visiting the boys we head over to Lerk Thai for lunch we ordered Massaman curry chicken ($11.90) chicken was tender curry was ok too not too spicy. Chicken in lemon sauce ($8.90) no wow factor normal. Seabass fillet ($12.90) fish quite fresh and is nice! Pad Thai seafood ($9.90) I would say I prefer the one at Bangkok Jem the taste is ok only so so nothing to rave about. Pandan Leaf chicken is on promotion so it cost only $5 chicken meat was tender and pandan smell so nice thumbs up for this dish. Belachan Kang Kong ($8.90) a not to be miss dish we will always order well cooked and I love the spiciness we also add on to a sambal french bean ($10.90) this is nice too! 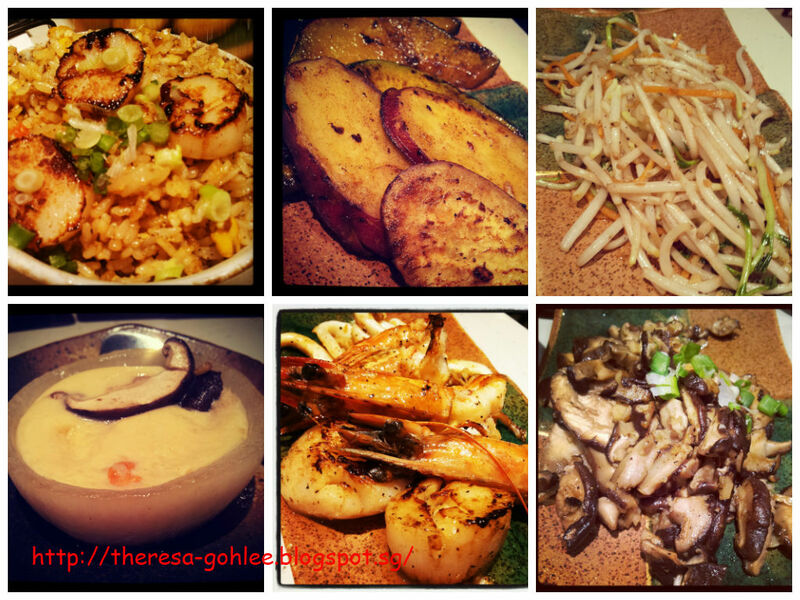 We had 2 Tom yum soup ($18 each) and 3 pineapple rice ($10.90 each) we were all so fool but we still order dessert - 2 Chendol ($4 each), 1 Red Ruby ($4) and 2 Glutinous Rice Mango ($6.50 each) my boss commented that the chendol is good ... for red ruby to me not the best but still ok worst is the glutinous rice mango the rice served chill which makes the rice more hard and mango is quite sour too ..... everything seems not very right! Total bill of this meal is $190.80. Is quite disappointing cos in other outlet which I tried is good but here is a total no no ..... quite embarrass cos I told them is good but actually is not! 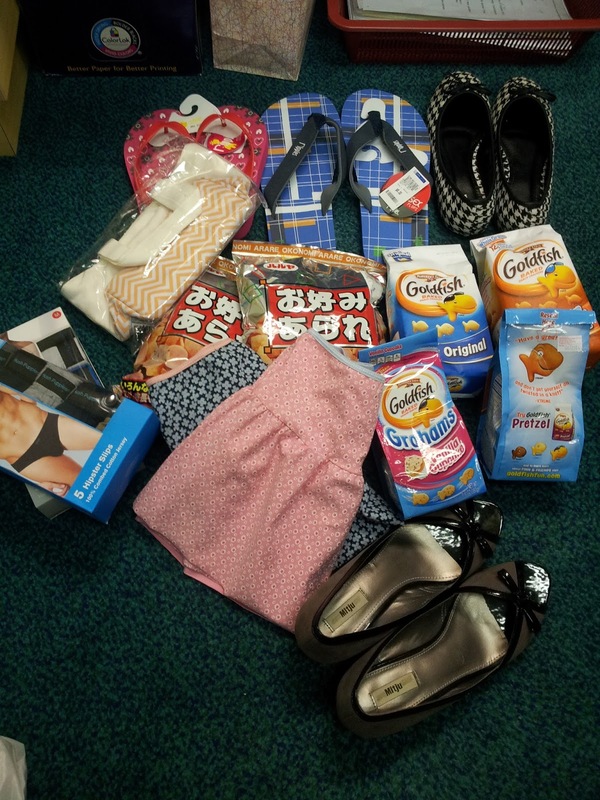 After the lousy meal we went over to John Little sales and in less than 15mins in my basket 2 pairs of Mitju shoes, 2 pairs of ripples slippers, rippers small tote bag, Alyssa's biscuit/skirt, tidbits and brief for my Goh. Colleagues jaw drop with my buy .... cos they taking own sweet time to go around first before making decision. To me having sales is I see what I like, I buy! 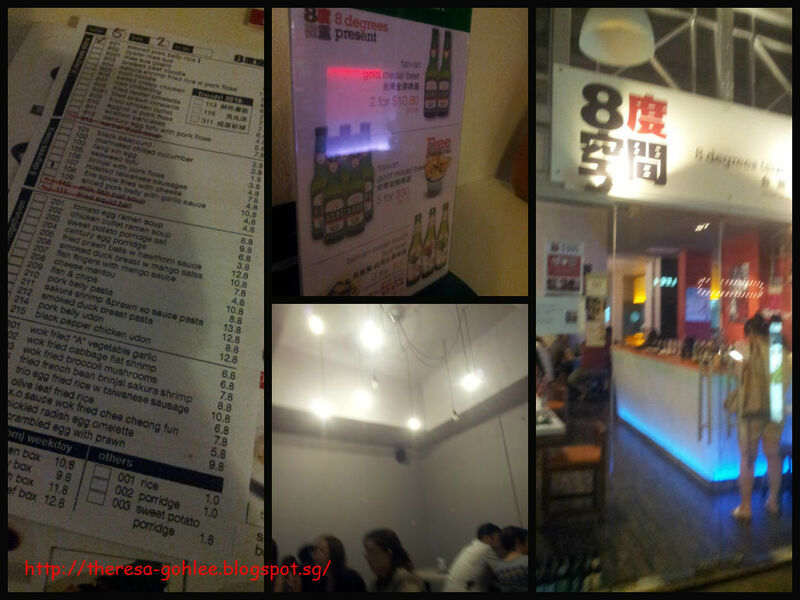 Received a leaflet about Sinpopo Brand Cafe ..... and looking through the menu a few dishes caught the glutton me wanting to visit this place. Sinpopo this name struck me about sleazy night club back in the olden days and I think I still see one name 新宝宝 night club along Tanjong Katong road! Nostalgia ambiance with is retro signage plus the pulling gate with sliding television really bring back some of my memories. 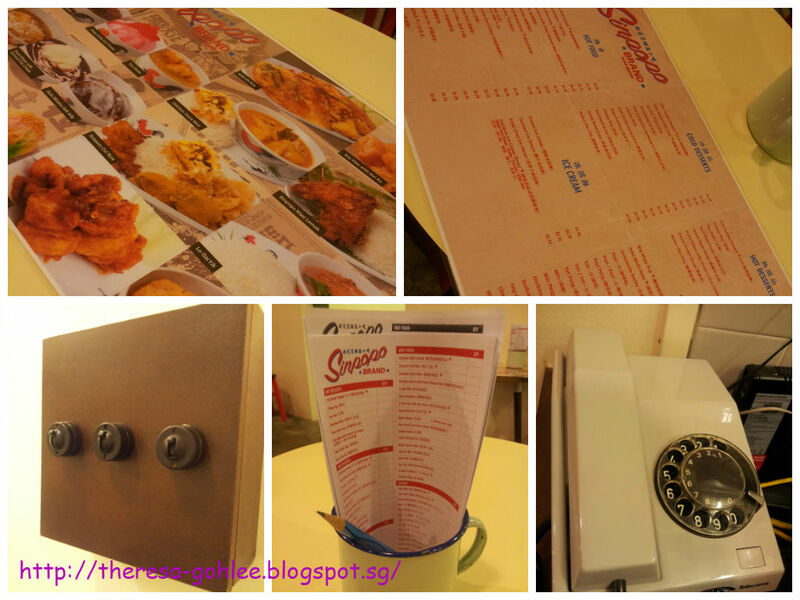 Poster were seen on the walls, rotary dial phone are placed near the counter. It was a semi self service, write down order on the order chit provided which is on the old school kind of tin cup and make purchase at the counter and the service crew will then serve you the orders when is ready! Goh ordered their scissor cut rice ($8.90) which consists of curry chicken, cabbage, some pork chop slice and an egg the portion is huge! As for me I go for the old school type of curry chicken ($8.90) portion is also big. We also ordered Sng Muay Pop ($3.90) to go along with our meal. Sny Muay Pop is actually Sprite with fresh calamasi and sour plum ice balls and when this melt into the drink it gave a tangy and salty feel really very 开胃! I am so in love with it! 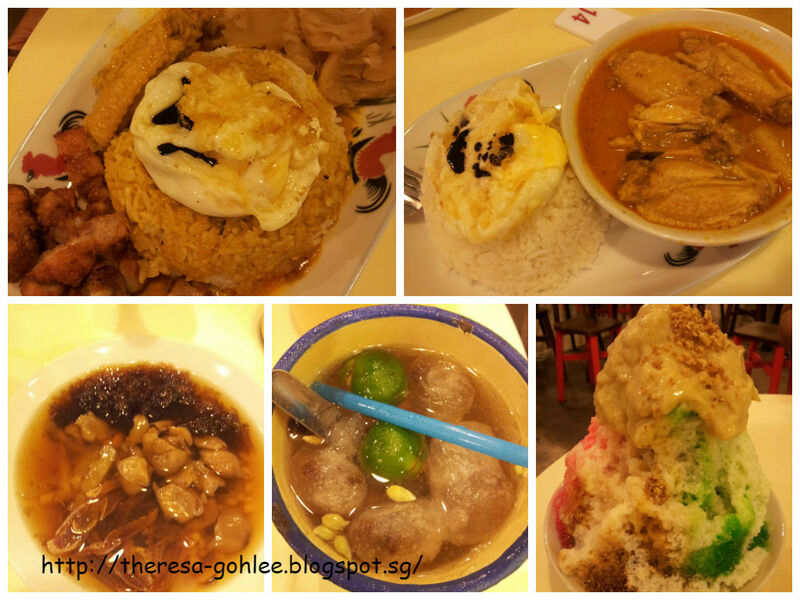 Didn't know the portion is so big we did order dessert as well I go for Cheng Tng ($3.90) and Goh had Durian Ice Kachang ($4.90) again the portion is really big and so both of us came out with a big tummy! Is Alyssa's day again ..... every week this day I will be happy cos is mid week as well work for another 2 days will be weekend! After dining with her my MIL told me about some of Alyssa's laziness or maybe should I put lost on concentration. MIL told me she will write halfway and complain about hand pain, tired etc. 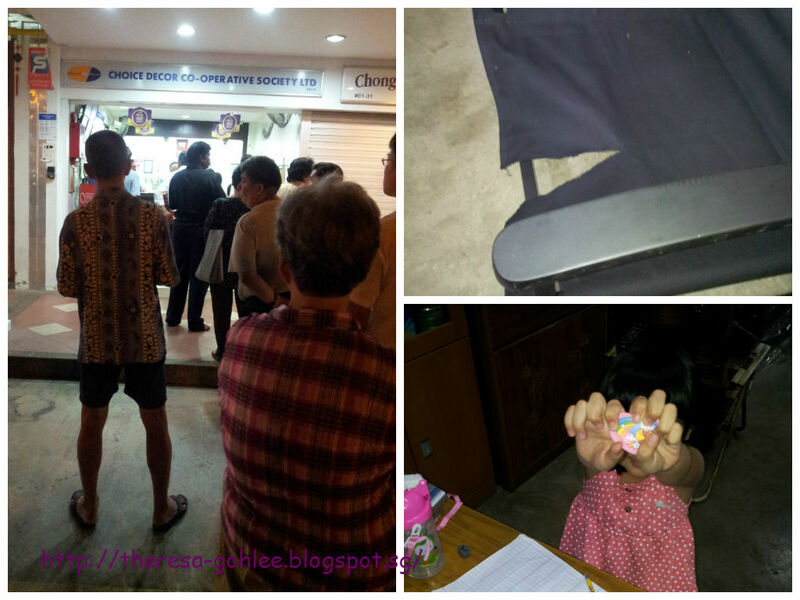 Anyway she dare not to stop doing she will continue to write when she is ready after her "rest"
As a fire break out at the Singtel Bukit Panjang exchange in the afternoon and disrupted the service of their own, rival telco, banks and simgaporepools so I am unable to buy 4D in the afternoon so I went to join the queue at my MIL's place there hoping to buy cos they have actually delay the draw to 9pm instead of 630pm. But waited till 830pm the system wasn't up and heng ah my numbers never open well save me $20 in my pocket. Craving for some sweet dessert after we reached the carpark we walked over to the interchange to get. 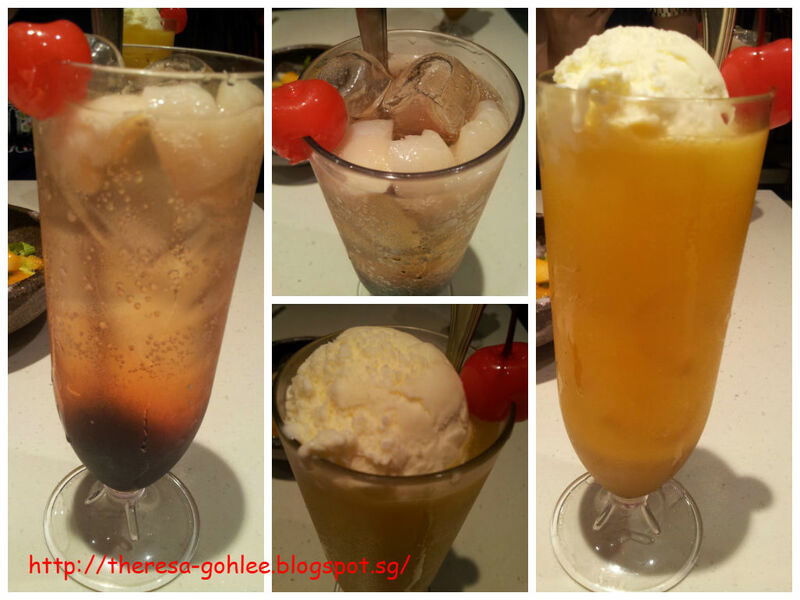 Disappointed the dessert not very nice ..... the barley gingko is quite failure ice kachang is way too sweet .... i know is suppose to be but is not the usual sweet. 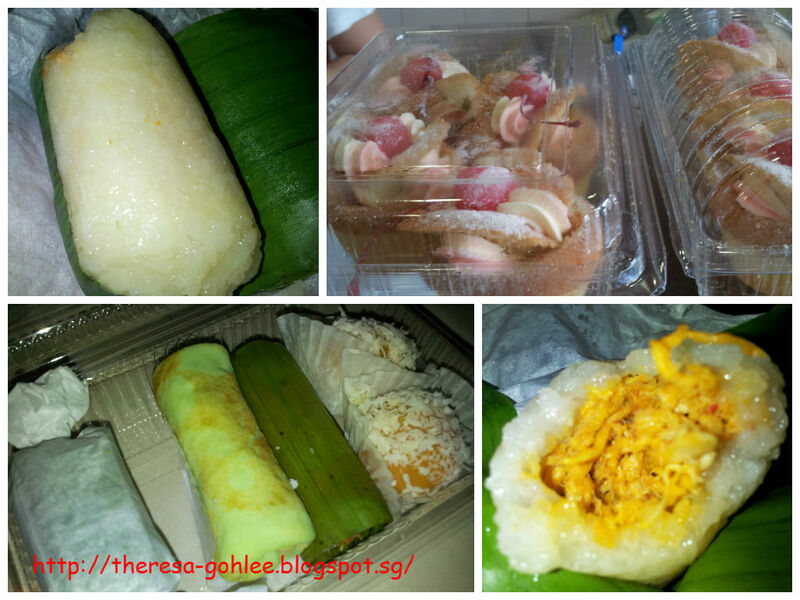 Hard to find nice ice kachang in Singapore right now ..... let me know if you know one! 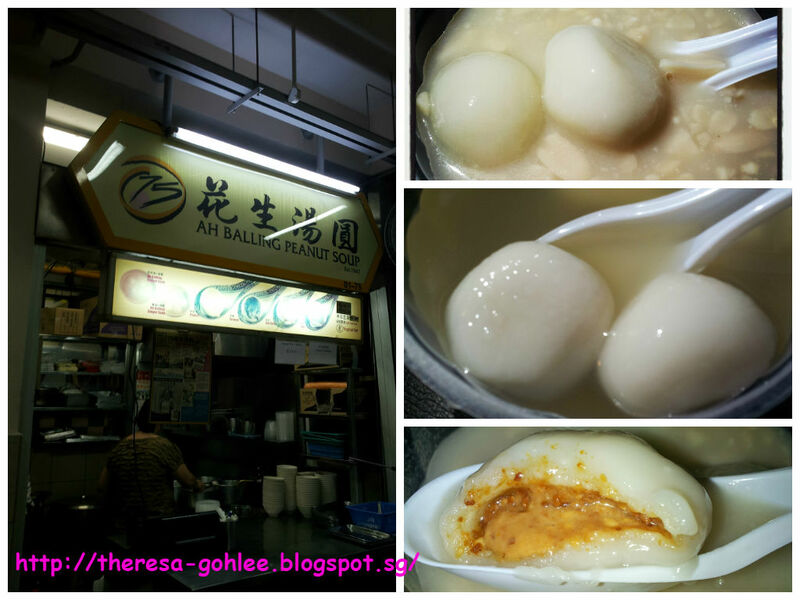 Craving for Beach Road army market fishball noodle so we head over there to pack back dinner. 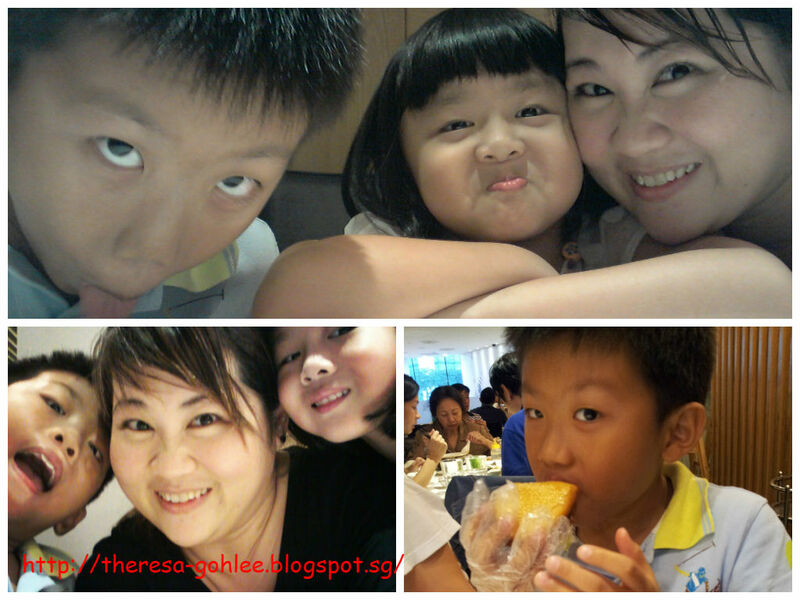 Tong Seng fishball noodle is located basement B1-02 and I have this since young till now ... 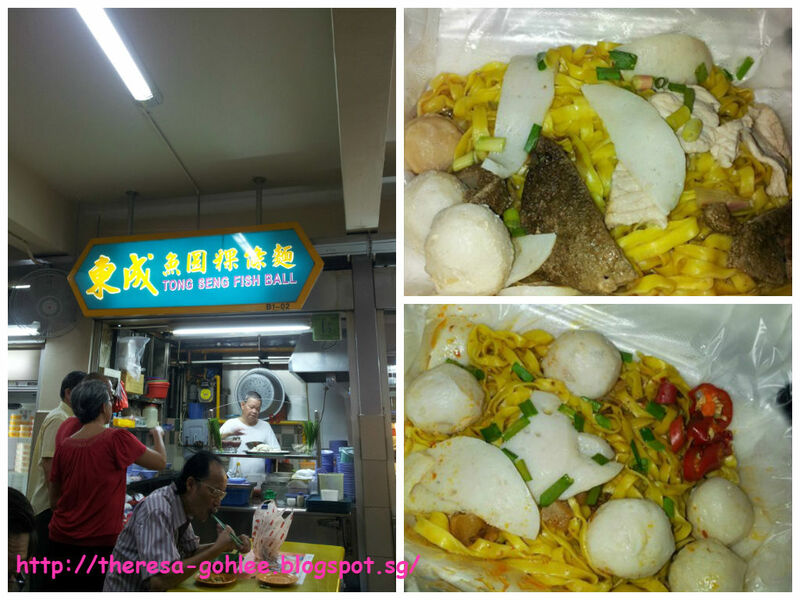 I really love the QQ fishball and of cos their noodle is always cooked just nice will not be soggy! As I don;t take pork I will asked for all fishballs and they used to have $3 option will have pacific clam now no more pacific clam :( . 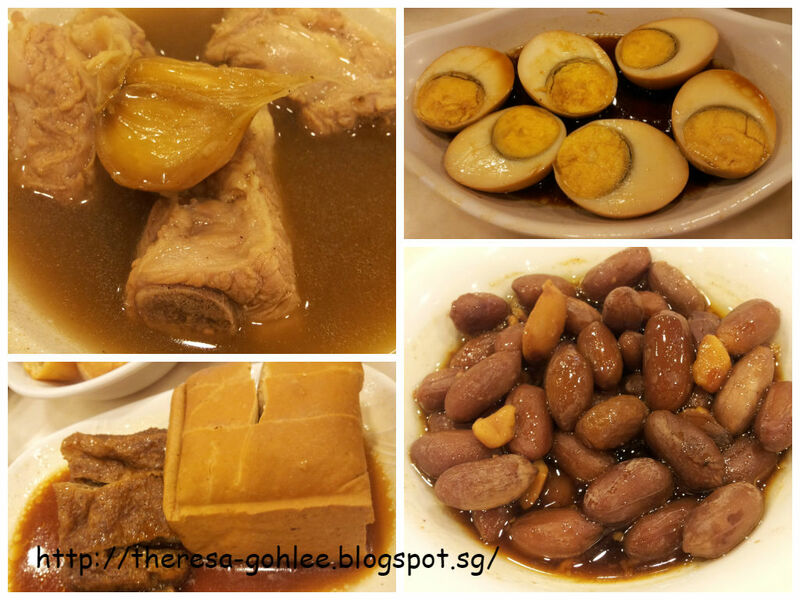 As for Goh he go for mix which contain liver and pork slices with fishball and meatball! 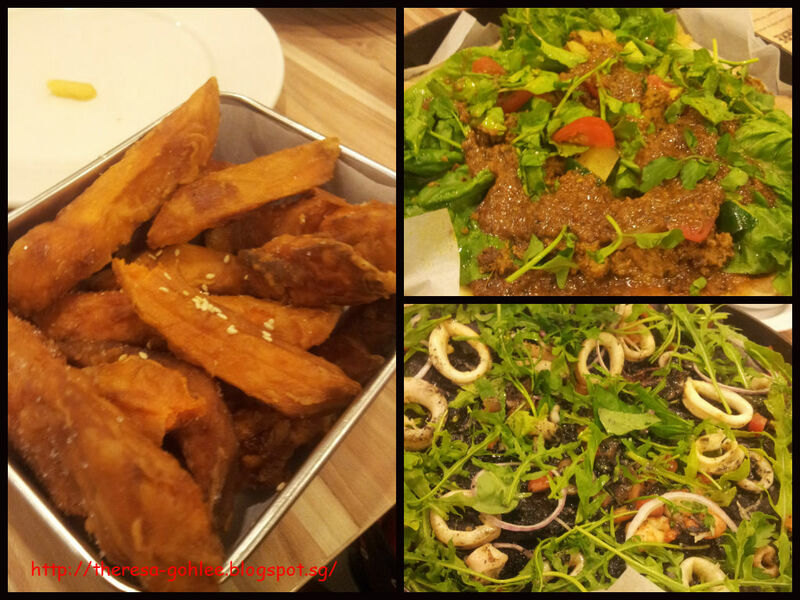 Goh also commented that the liver is cooked nicely! Thumbs up! 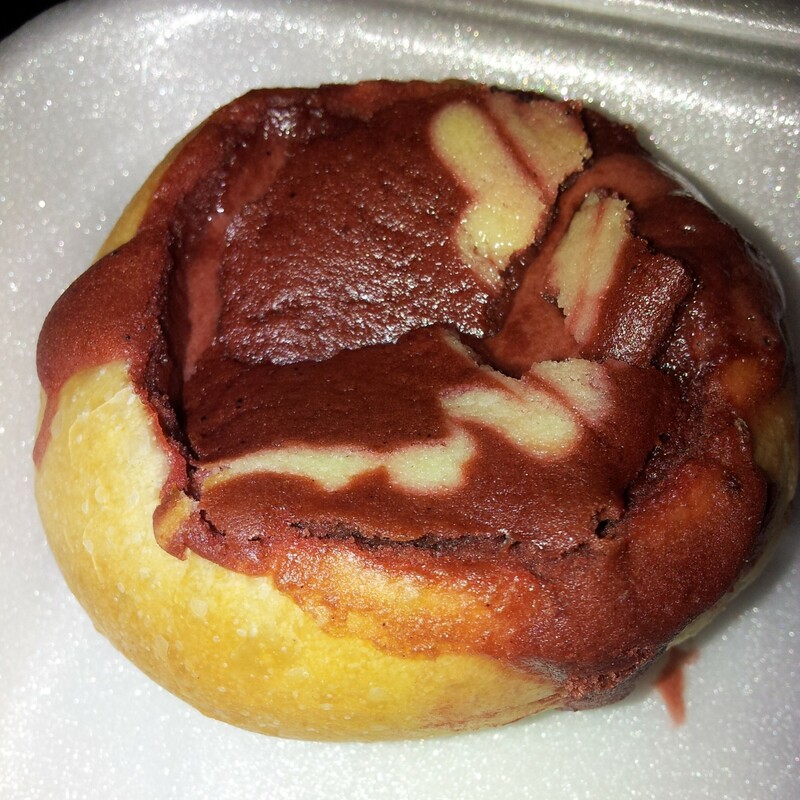 Went to take a look that if Mr Baguette still open and they only left a few flavors so I get some red velvet flavor this is also one of the oozing out effect. 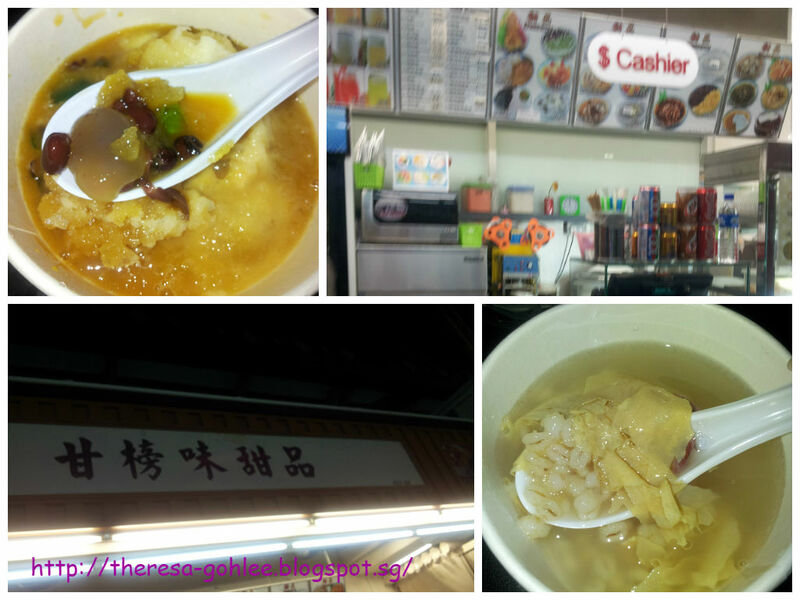 Went up to #01-75 where the Ah Balling Peanut Soup dessert is and bought one ginger soup base and one peanut base soup. Use to love sesame balls but now I prefer the peanut the oozing out filling is nice. 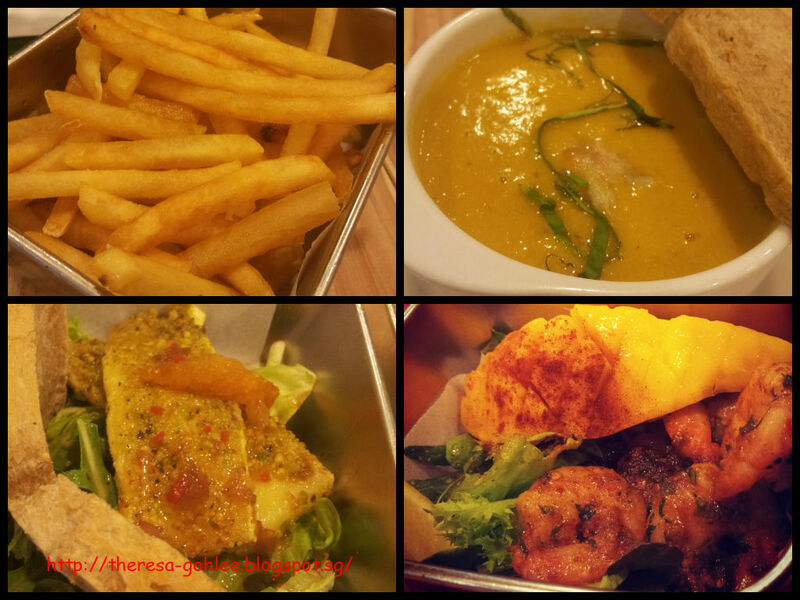 Satisfied dinner I had with Goh! 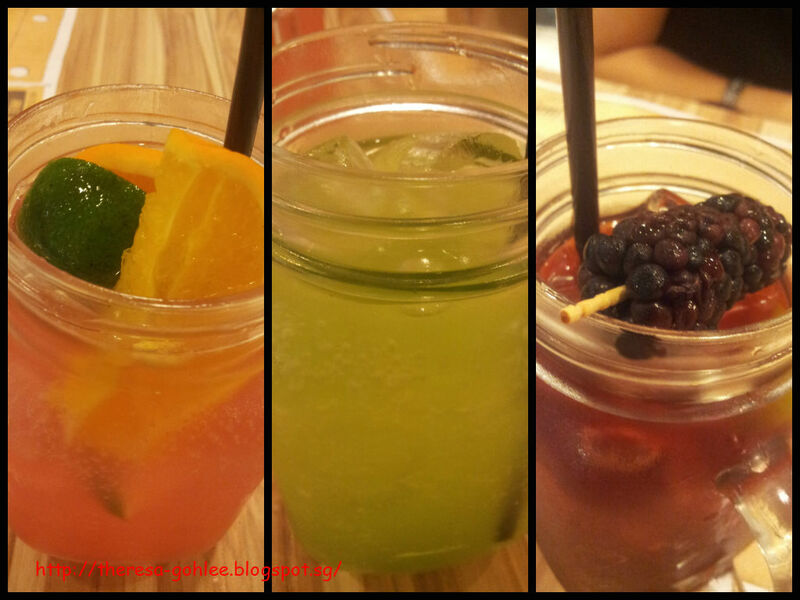 YUMZ!